This article originally appeared a TalkPoverty.org. But in recent decades, as trade deals shipped most of the middle-class jobs overseas, recessions hit, and labor protections deteriorated, that kind of shared prosperity vanished. Now many residents work in the service industry and can barely get by. As a result, more than 21 percent of the city’s residents live in poverty, and it cuts across demographics—including 22 percent of whites, 23 percent of African-Americans, and 28 percent of Hispanics. Racine has the highest unemployment rate among large cities in the state. The school district serves approximately 20,000 students, and between 1,000 and 1,500 are homeless for all or part of the year. 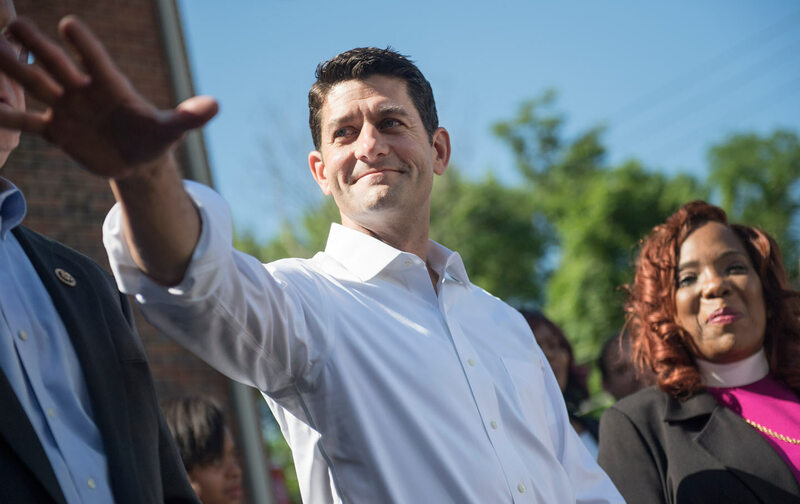 On Saturday morning, in Speaker Ryan’s hometown of Janesville, a dozen people lined up outside of Echo food bank a half-hour before it opened. But on the other side of the river, where Echo is located, the damaging effects of lost jobs and low wages are on full display: dilapidated and boarded-up houses, vacant retail spaces, the palpable tension of people struggling to simply make ends meet and tired of it. But Robert, who works for Walmart, shared his story. He has a 45-minute commute to his job, and this March his car slid off the road in the snow and hit a tree. He no longer has reliable transportation, and he and his family were recently evicted. They relocated, but now face a high electric bill. Peter and his 9-year-old daughter, Love, met us at the Halo homeless shelter back in Racine. They had recently returned from 10 months in Chicago, where Peter cared for his mother who is diabetic while working as a driver of a medical-supplies van. When his mother was stable, Peter and Love returned to Racine and moved in with his girlfriend. But she had fallen behind on rent due to her own hospitalization with sickle-cell anemia, and they were evicted from the apartment. Peter and Love slept in his car until they discovered Halo. The organization found them a permanent, subsidized house, for which Peter now pays 30 percent of his income. He obtained work operating a forklift, but the work dried up and he was laid off at the end of May. Peter described himself as “very skilled,” and was confident he would quickly find another job given his experience as a commercial vehicle driver, medical assistant, machine operator, and working in community-based residential facilities. He had filled out 100 job applications in the past week, and gotten two job interviews. He expected an offer for work in Kenosha, but was concerned about the commute in traffic and time away from his daughter. Part of the reason he can’t find a job with a good wage in Racine might be that his skill set doesn’t match the limited number of high-tech manufacturing jobs that remain in the city. In better times, Peter might have been able to return to school for those jobs. Mason said that until 1980 there was no tuition for technical colleges in the state. But the state and federal governments stopped making the necessary investments, and now people who are struggling are expected to rack up $20,000 in debt in some cases to return to school. For the past five years, he has worked at a foundry melting metals for reuse. It’s known as “the little hell” because in the summertime, when it hits 80 degrees outside, it is 130 degrees inside the foundry. Prior to this job Gabriel worked at a duck farm, doing 12-hour shifts with just two breaks—30 minutes for lunch, and 10 minutes for the bathroom. If workers attempted to take another break, they were sent home. Because of Deferred Action for Childhood Arrivals, Valeria is able to get better jobs than her father can, and currently works in sales. College, on the other hand, has had to wait, since Governor Scott Walker repealed in-state tuition for undocumented immigrants in 2009. Valeria has lived in Ryan’s district since the age of 3, and has met with him through her activism in the immigration-reform movement. She is frustrated with his pledges to support immigrants and subsequent actions that she feels demonstrate a lack of commitment. But if Ryan’s latest poverty plan is any indication, he won’t be supporting a bold antipoverty agenda any time soon. His plan calls for cuts to much of the safety net that remains for his constituents. It includes cuts to unemployment assistance, phasing out the Head Start program, and rolling back federal Pell Grants for students trying to get a higher education. It does little to nothing to create jobs or raise wages. In fact, it looks a lot like this year’s House Republican budget—which gets more than 60 percent of its cuts from programs that help low- and moderate-income Americans, while protecting tax cuts for the very wealthy.